iLoveToCreate Blog: Naughty or Nice? I put the "wack" in a pair of snuggies for our site at iLoveToCreate, and I totally LOVE them! Of course, when I saw that the snuggies were everywhere for Christmas, I had to embellish them with my own wackiness. You can decide if you want yours to be Naughty or Nice, or maybe you just want to add your name. And what a perfect idea to personalize a snuggie for your boyfriend! I can just see it now... the sorority sisters with all matchie-matchy snuggaroonies with their Greek letters! Or how about with the name of their fave football team? The possibilities are amazing!! Use felt pen to trace “Naughty” or “Nice” pattern onto contact paper. Place contact paper onto cutting mat or piece of cardboard, shiny side down. Cut out letters with craft knife to create stencil. Place stencil shiny side down onto black or white fabric and iron on. Squeeze a puddle of Fashion Glitter Bond onto foil. Working quickly, tap flat end of makeup sponge into Glitter Bond and dab a generous amount into stencil openings. Immediately sprinkle glitter over Glitter Bond and use finger to press down on glitter to set. Let dry then peel away stencil and shake off excess glitter. Peel backing from Santa Hat Iron-On Transfer and place plastic side up where desired next to wording. Cover with a thin cloth and iron onto fabric following package instructions. Cut fabric around word and Iron-On Transfer, leaving a 1” border. Refer to photo. 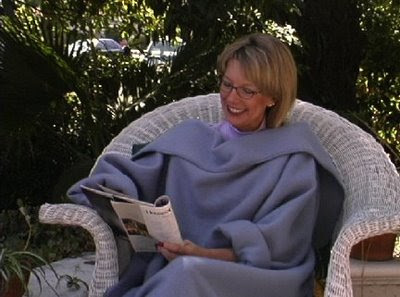 Place fabric piece on Snuggie™ where desired and sew in place leaving a ¼” seam. Now, I don't know if you have read my sad story about MY adventures in SNUGGIES about 10 years ago, and how I COULD HAVE BEEN a Buh-JILLIONAIRE, but my girlfriend and I didn't have the cash to start the business. Totally a cool update on the matronly ol' snuggie! P.S. I linked back to Ilovetocreate.com for the paint!